Nevertheless he did take steps to give his opera a few Japanese elements. 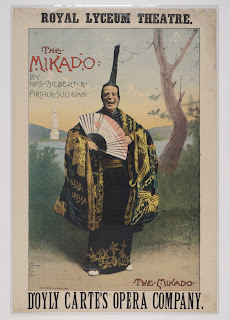 The Mikado really was the word used by the Japanese for their emperor and the Miya sama chorus, which Gilbert and Sullivan unashamedly filched, words and all, was the marching song of the Mikado’s troops as they advanced on Edo (soon to become Tokyo) in 1868, written by Yajiro Shinagawa, a samurai, and put to music by his geisha lover. 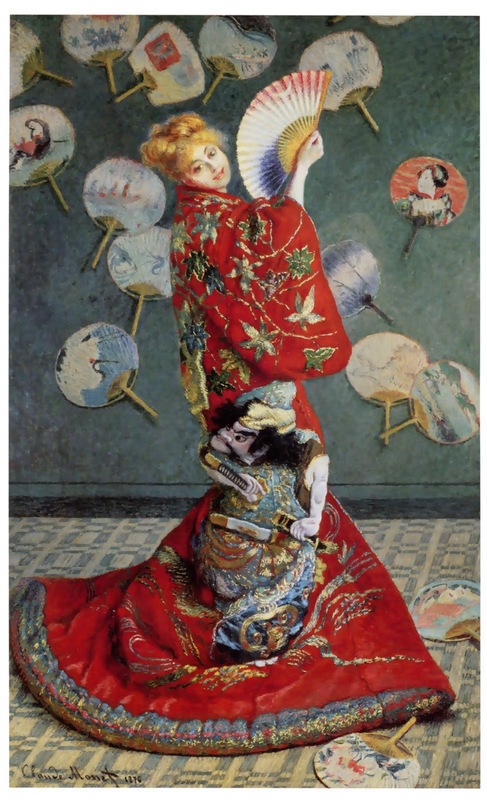 Gilbert also sent for a young woman from the Japanese Village which had just opened in Knightsbridge to give the Three Little Maids lessons in dance, deportment and use of the fan. He describes her as ‘a very charming young lady’ who came every day to put her charges through their steps and adds, ‘It was impossible not to be struck by the natural grace and gentle courtesy of their indefatigable little instructress, who, although she must have been very much amused by the earlier efforts of her pupils, never permitted them to see that the spectacle of three English ladies attempting for the first time a Japanese dance in Japanese dress had its ridiculous side.’ She must have taught in the Japanese way, by imitation, as she didn’t speak any English other than ‘Sixpence, please’, being a tea server, and the English actresses only knew ‘Sayonara’. 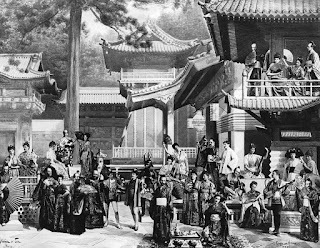 It’s rather extraordinary to think that there was a Japanese Village with 100 residents in the middle of Victorian Knightsbridge. Japan had opened to the west only 27 years earlier, in 1858, when the first American consul, Townsend Harris, signed the Treaty of Amity and Commerce. The prohibition forbidding Japanese to leave the country under threat of execution was lifted shortly afterwards. People soon began to take advantage of the new freedom to go abroad. The first were official delegations and diplomats, plus students and circus artists. The first Japanese performing artists arrived in England in 1867. Led by a man called Matsui Gensui, the troupe consisted of twelve Japanese jugglers - seven men, two women, two boys and a girl. ‘The children are whirled around in huge humming tops,’ reported The Times. ‘The others walk on the slack rope and do the famous butterfly trick’ (which involved making paper butterflies appear to flutter at the end of a fan). Other acrobats and jugglers quickly followed. Meanwhile, with the end of the old order, daimyo warlords and samurai found themselves broke and took to selling their swords and other heirlooms, to be snatched up at bargain prices by western collectors. Japanese artefacts flooded the west - screens, fans, kimonos, lacquerware, blue and white porcelain, vases, curved swords, netsuke and bonsai. Japonisme became the flavour of the day and fashionable ladies disported themselves in kimono, as in James Tissot’s distinctly un-Japanese-looking 1864 La Japonaise au Bain and Monet’s 1876 La Japonaise, later to cause a scandal at the Boston Museum of Fine Arts. The Japanese Village opened in January 1885 in Humphrey’s Hall, a large splendid building used for exhibitions, a kind of Victorian Earls Court. It was in Knightsbridge Green, near Albert Gate, a couple of blocks from Hyde Park, around the corner from Charles Digby Harrod’s recently established Harrods’ Stores Limited and a couple of streets behind Harvey Nichols, founded some fifty years earlier in 1831 by Benjamin Harvey and James Nichols. Humphrey’s Hall was ‘very handsome’, open, light and ‘exceedingly well ventilated,’ with a single span arched roof, a raised skylight, white marble floors and a gallery at either end. The Village was intended to enable visitors to imagine they really were in Japan. Running down the centre was a broad street of one or two storey Japanese houses built by Japanese workmen of bamboo, wood and paper, with sliding trellis shutters and translucent paper screens, with red lanterns hanging from shingled or thatched roofs. Behind this main road were five more streets of smaller shops where there were displays of pottery, wood and ivory carving, toys, fans, cabinets, inlaid metalwork, lacquerwork, textiles and embroidery, though nothing was for sale. Painted backdrops showed distant hills and snow-capped Mount Fuji. 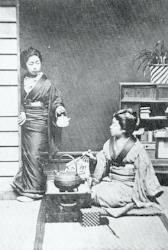 Here Japanese in traditional dress strolled up and down and engaged in all the activities of everyday life. Everything was done to bring the Village to life. Visitors could watch artisans at work, then take tea, served on lacquered trays by kimono clad attendants, in two teahouses equipped with chairs in deference to stiff western joints. There was a Shinto shrine and at the far end a Buddhist temple where two priests officiated, though they steered clear of any rites that might offend their hosts’ Victorian sensibilities. There was also a Japanese garden. In a second hall, the newer part of the building, there were displays of kendo, sumo wrestling and martial arts. There were rickshaws to ride in and ‘Japanese Musical and other Entertainments’ throughout the day. Posters promised Wire Walking, Pole Balancing, Top Spinning, The Great Ladder Feat, ‘The Gayshas or Dancing Girls’, Wrestling, Sword Exercise and much else. In fact the hundred were made up of all sorts of people - samurai down on their luck, metalworkers, rickshaw pullers, artisans and dancers. 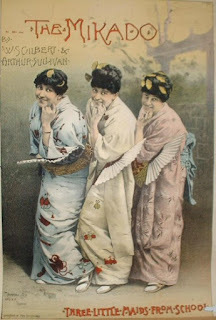 The mastermind behind the project, a man who went by the splendid name of Tannaker Buhicrosan, emphasised that they would not take any geisha (contrary to what was promised on the posters); they would not do anything that would tarnish the image of Japan. Nevertheless a lot of applicants were refused passports and a couple travelled illegally without passports. Some got passports allowing them to go only as far as Hong Kong and had to leave Yokohama rather quickly before they were found out. A couple got passports to Paris then crossed the Channel to London. The Village was a huge success. Cost of entry was one shilling (sixpence for children) and it was open 11 to 10 daily. Two hundred and fifty thousand visitors passed through the gates in the first few months. But then on May 2 1885 came disaster. The Village caught fire and burnt down, destroying the hall, damaging nearby Albert Gate Mansions and killing a Japanese woodcarver. It was immediately rebuilt bigger and better. While it was being rebuilt the troupe went to Berlin. By the end of the year there was a new Japanese Village with several streets of shops where goods were offered for sale. There were also two temples, ‘various free standing idols’, a pagoda and a pool spanned by a rustic bridge. The Sun Music Hall next door had been acquired by J.C.Humphreys just before the fire and now offered ‘astounding entertainments’ by Japanese artistes. In all over a million people visited. The Japanese Village finally closed in June 1887. As for The Mikado, that continues to delight audiences to this day and has bestowed immortality on the 1868 marching song of the Mikado’s troops. 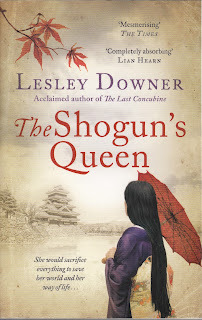 Lesley Downer’s latest novel, The Shogun's Queen, an epic tale set in nineteenth century Japan, is out now in paperback. For more see www.lesleydowner.com. 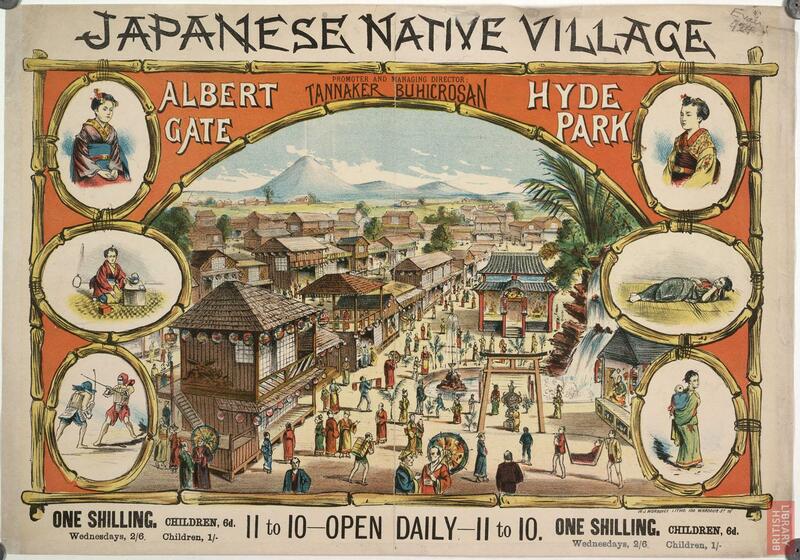 The poster of the Japanese Native Village is private collection. All other pictures courtesy of Wikimedia Commons. How delightful! I can understand why the Japanese government cringed, though. I would have, too. But it paid the bills for the performers and I bet The Mikado got a lot more people visiting the Village. Japanese are fine with Madame Butterfly but The Mikado is still problematic - not surprisingly. Fascinating, Lesley, and I remember how Japanese people loathe The Mikado (and Madame Butterfly). I like the way this story is told in Mike Lee's Topsy Turvy.